There are all sorts of products and resources out there that people are trying to sell youth workers to tell them what they need, but I have found few of these things actually make a difference. This past week I was offered powerpoint games and a photo scavenger hunt list. I generally don't feel a need to fill my time pursuing games and scavenger hunts and if I do decided to do something like that, I would like something actually tailored to my group. Plus these resources all have to do with making your program stronger, not to make you more skillful as youth worker. We have some regular events that we host in our area, but we do no games, we have no ice breakers, we have no band. The rest of the week we go to the places that the youth are at everyday and we hang out with them. I trained a team that know how to do this type of work day in and day out, but I remember when I was a youth pastor in a small church not knowing what to do with kids when I would meet them on their way home from school or at the skatepark. Now I prefer those settings. I am a particularly odd example of a youth worker as I am introverted and being around people drains me as so I carry a bag of tools with me all the time. Some people call it a European carry all, others a purse, and I prefer to call it a man bag. 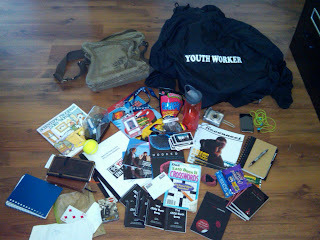 The truth is if I were a businessman I would carry a brief case, but as a youth worker I carry a bag. So go ahead and ridicule me for a few minutes. I'm used to it. Now that you are through laughing at me I would like to show you the contents of my bag and what I use these things for. First of all the youth worker identification. 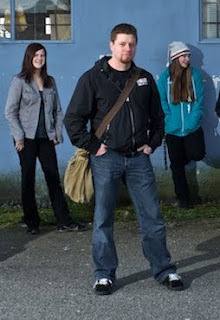 We had jackets made as well as ID tags to help keep us clearly identified as professional adult youth workers. This is good when we are meeting with youth and their parents pick them up. Business cards. Always have a supply of contact info on hand for parents, teachers, coaches, social workers, police, etc. We want to give them an opportunity to check out our claims. That we indeed are who we say we are. Volunteer Applications. I never know when I might meet someone that has an interest in being involved in what we do. This also has a list of policies and procedures for youth work that are good to keep on hand. A book. I always keep a book with me in case I the youth I hope to meet with forget to show up or are running late. Or sometimes youth are simply not in their regular hang out places. This keeps me from getting bored. Food. i work out on the road a lot and need to makes sure that I am eating while I go. However, we also run into youth that don't eat due to financial or emotional reasons and we want to be able to supply them with somethings. Ipod. This has games and music on it that you can use to bridge a gap with. Magazines. Our team puts together magazines on youth related topics that we like to give out to youth or even encourage them to write. If nothing else the topics of the magazines can make for good discussions. A cheap digital camera. This is something which I can use to record fun moments but not worry about breaking. A blank journal. This is something that I can give away to youth when they need to learn how to vent in a healthy way. Playing card. I know quite a few games and magic tricks enough to fill a few hours of time with. Cross word puzzle books. great way to interact with youth while working on something together. My own bible and journal. Sometimes I need time to reflect and read myself. Coloring book and crayons. Another great activity to do with youth that you first meet. Remote control car. Awesome way to meet youth, ram the car into them and then offer to let them try it. Notebook. Way of remembering things. A comic book. Another cool thing to break the ice with and interact about. My blackberry. takes pictures, accesses facebook and twitter, I can blog and text. of course I was using it to take this picture of my stuff. It is not an exact science, and it has to be things that fit with your personality. One of my favorite things is to carry memories. Things like the five of diamonds is from the day I went to see a girl in the hospital after an accident. The playing cards were all over the ground. i took one to remember the day. I always have. These are simple things and in my find things that will last longer than any powerpoint game. What would you add to my bag?